Whether you need to engage remote students, record daily classes, stream events for overflow rooms or expand your distance education capabilities, Ensemble Studio is a lecture capture solution to consider. Ensemble Studio, our lecture capture system, simplifies lecture capture for any educational organization. Our lecture capture solution provides easy, automated lecture recording in classrooms, meeting rooms, labs, and medical training rooms. Leverage our software and/or hardware lecture capture so your users can present and teach comfortably, free from technology worries. Presenters can be confident that everything they say and display is captured and auto-published to their publishing destination. From small lecture capture deployments to campus-wide implementations, Ensemble Studio is simple, flexible and affordable. Create screen, webcam and audio recordings wherever and whenever you want. Ensemble Anthem is a powerful Mac and Windows software lecture capture solution supporting your lecture capture and screen capture needs. 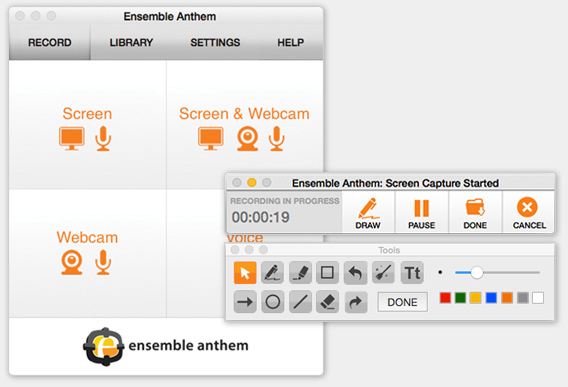 Ensemble Anthem enables users to easily record your screen movements with audio and/or record video from a webcam. Once the user has finished their screen capture it can be edited and then it is automatically uploaded into their Ensemble Video library and can be auto-published to any playlist or LMS. Finally, you have deployment flexibility with Ensemble Anthem, Ensemble Anthem can be loaded on personal computers for personal capture and Ensemble Anthem Pro can be loaded on managed Windows computers for lecture capture in classrooms, labs and auditoriums! 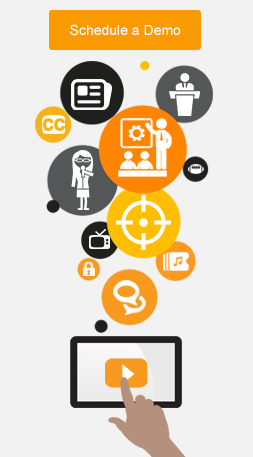 Learn more about our Software Lecture Capture solution now! The complex and expensive recording hardware is no longer required to effectively capture classroom presentations in lecture halls, Ensemble Studio offers two simple and affordable recording devices. A typical Ensemble Studio setup would consist of video and audio of the presenter and a computer source with supporting material which can be mixed into a video experience. The video and audio are recorded and streamed by the Matrox Monarch LCS. Learn more about our Matrox LCS dual-video input recorders or Matrox HD single video input recorders. 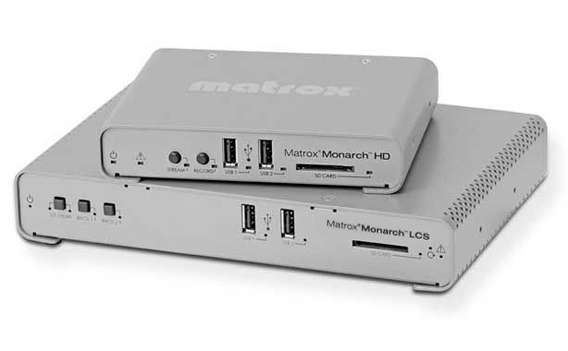 The Matrox Monarch LCS and Matrox Monarch HD are affordable, easy-to-use video streaming and lecture recording devices designed for organizations that need to record and/or stream lectures. Ensemble Studio lecture recordings are initiated in a variety of ways on a campus. 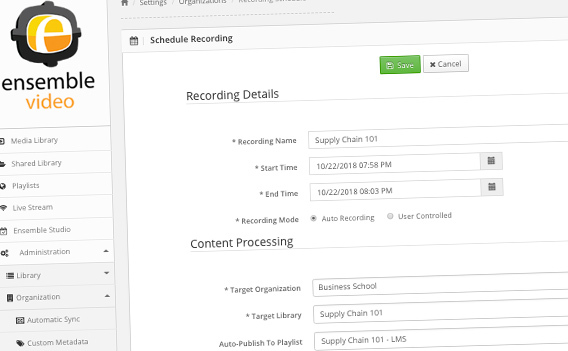 Instructors can request (or setup) automated recordings of lectures or special events in classrooms to automate lecture capture or they can start classroom recordings on demand. In both cases, Ensemble Studio will be place the lecture recording in the appropriate media library and Ensemble Video will publish the lecture recording to the faculty member's course LMS page. 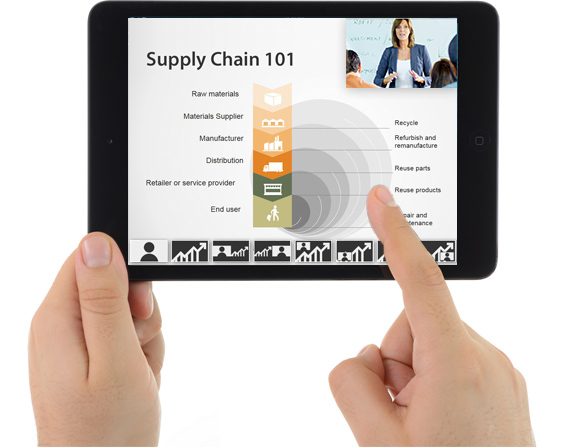 Once the lectures are posted online, students can view them on-demand (or live) on their mobile device or computer. All the Ensemble Studio lecture capture recordings can be played back on any device, in any LMS, at any time. The majority of our customers are leveraging the Matrox Monarch LCS, so viewers access videos through our popular dual-stream lecture capture player. This players allows the viewer to select the viewing layout at any time while watching the video. In addition, all Ensemble Studio hardware devices can simultaneously live stream lectures to remote students while recording the classes into our lecture capture management system. Whether you choose our lecture capture software or lecture capture hardware, you'll have access to these great features: Video Accessibility, Video Quizzes, HD Playback, Annotations, Viewer Reports, Security, LMS Integrations, Playback Speed, and Branding. Ensemble Studio is a turnkey lecture capture solution that streamlines video capture, video management and video publishing. Please review our core features below or you can view all our features here. Our video platform enables users to build and publish course video playlists to their LMS, branded portal, blog, webpage or wiki. Ensemble Studio, our lecture capture system, simplifies lecture capture for any organization. 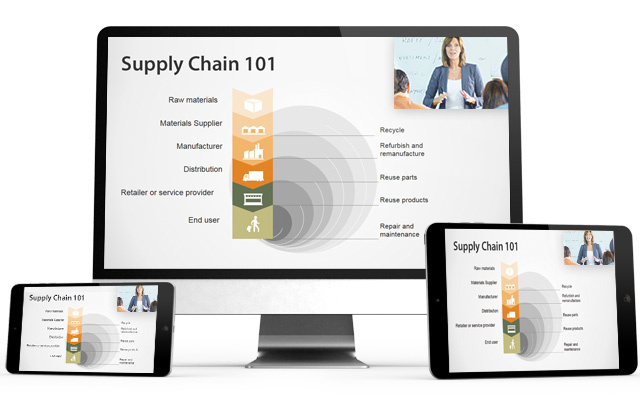 The Video Quiz feature allows instructors and trainers to create video quizzes on top of their videos and then publish them in the LMS, CMS, blog or webpage. 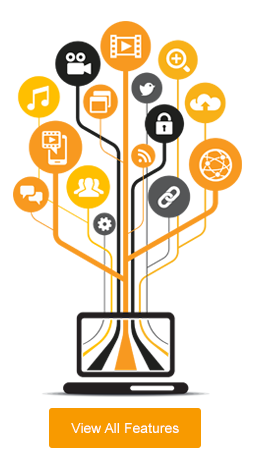 We offer a full set of video accessibility features that supports centralized and distributed accessibility solutions. Our lecture capture solutionv offers simple and effective ways to broadcast live classroom lectures to a webpage, LMS, CMS or blog. Ensemble Video's HD Playback streaming guarantees a quality playback experience, no matter what device your viewer is using. Ensemble Video enables users to create high quality audio description services for online video, at no cost.